Over dinner recently, a fellow Gadling blogger, some other travel lovers and I were discussing the merits of San Francisco. We decided that our favorite part about it was that it just has that special amount of “funk” that is hard to find in other cities. It’s hard to describe, but if you have been to San Francisco, you know what I am talking about. That feeling is perfectly captured in this photo of colorful and slightly seedy signs on a main drag in the city of hills and streetcars. It’s busy, and you get the feeling that behind every sign is a story. Makes me want to go and spend a sunny day exploring. Want your own photo featured on Photo of the Day? Submit it to the Gadling Flickr Pool or on Instagram by mentioning @gadlingtravel and tagging #gadlingtravel. It’s not easy to frame a scene perfectly for a photograph, especially at a popular spot full of tourists. But Flickr user Kumakulanui did it twice for today’s Photo of the Day. 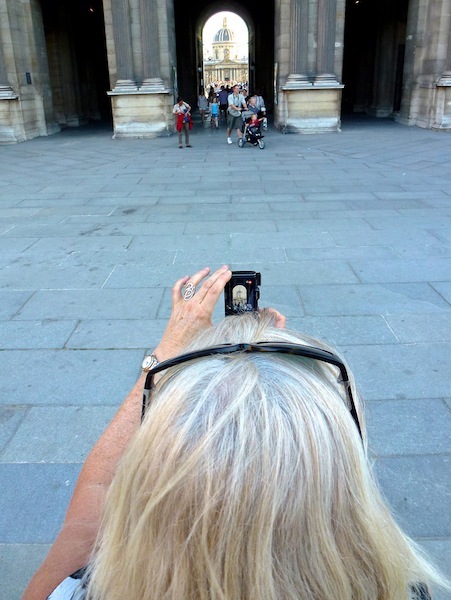 Taken at Paris‘ famed Louvre museum, he captures both the larger scene of people and architecture, as well as the close-up his travel companion is shooting on her camera. The result is a very clever double take, giving you two images for the price of one. Want your travel photography featured here? Add them to the Gadling Flickr pool, and please don’t forget to enable downloading! The Gadling crew is one of the most diverse groups of travelers on the web. But different as we are, we’re united in our thirst for adventure and our hunger for the open road. You read about our adventures here. Now, we’d like to invite you to travel with us in real-time – on Instagram at @GadlingTravel. Each month, a member of our team will take over the @GadlingTravel Instagram feed for one week and post images from his or her travels with the hashtag #ontheroad. This week, I’m posting photos from my current trip to sunny Oaxaca, Mexico. It’s one of the most artistic and culturally vibrant places on the planet; I’m excited to be your eyes and ears while here. We’re also excited to open up Instagram as a platform for submitting original mobile photos into the running for Gadling’s Photo of the Day. Just mention @GadlingTravel AND use hashtag #gadling in your image post, and we’ll consider it along with photos submitted in our Gadling Pool on Flickr.